ThermAdor is a double-skinned insulated sectional door that looks great, is energy-efficient and is built to last. The door consists of strong Kingspan insulated panels of 40mm thick polyisocyanurate PIR insulation sandwiched between two sheets of high strength galvanised steel. This is the latest in technology designed to minimise heat loss through your garage door. 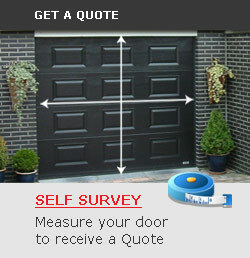 By minimising heat loss through your garage door you can maximise energy efficiency and reduce your heating costs. Check out the difference! Integral top and side weatherseals to minimise draught. A substantial 30mm bottom seal to protect against wind and rain infiltration. Seals between the panel sections across the entire width of the door to stop rain seeping through the door. ThermAdor Residential with THERMALsafe is fitted with an additional compression seal at both sides and top of the door. Please visit Upgrade to Kingspan THERMALsafe for more information. 40mm panel thickness for maximum strength, rigidity and security. Tightly interlocking tongue and groove panels and all round weatherseals mean there are no inviting gaps… it is virtually impossible to prise the door open. Our insulated panels are manufactured to overlap your garage opening. This ensures the panels are held securely within the track system and also reduces the possibility of the door being forced open at the sides. Optional SKG security upgrade to hardware kit. All ThermAdor garage doors are suitable for remote control automation. Automatic doors incorporate a unique, patented security system offering ultimate protection against break-in. Our German-made automatic opener meets the European SKG 2 certification standards for burglar resistance. The majority of homeowners choose to automate their ThermAdor as this provides additional security and convenience. If you prefer to operate your door manually*, a black handle with a Euro cylinder lock and dual action locking bars are available as an optional extra. The double bar locking action provides robust, reliable, long-term performance unlike cable locking devices which can stretch or snap over time. *ThermAdor sectional doors are supplied as standard without a handle and lock. Manual operation must be specified at time of ordering. The garage door is the largest moving item in your home and door failure can cause serious injury. Safety should be a key consideration when selecting your door. ThermAdor has been tested to the highest safety standards and incorporates the most advanced safety features available. Fully Compliant with Standards – ThermAdor is CE marked and compliant with the European Safety Standard EN 13241-1. Spring Break Devices by Kingspan –the springs used have been designed and tested to exceed 20,000 spring lifecycle. However, in the unlikely event of a spring breaking, the Spring Break Safety Device will activate and lock the door in position and prevent it from falling. Multiple Torsion or Extension Spring System –heavy duty dual torsion or extension springs ensure that the door is perfectly balanced at all points throughout the door cycle. Premium Quality Door Components by Kingspan –only the best quality door components by Kingspan are used to ensure ThermAdor is supported on the strongest foundation. Please visit the ThermAdor colour range to see the colours and finishes available.